New buds are starting to branch from this stem. Even so, it needs to be pinched off to shape the plant and promote root development. I rather feel like there’s nothing new in the universe. But I’m not certain. Everything is connected or one thing leads to another, or so I’ve seen. 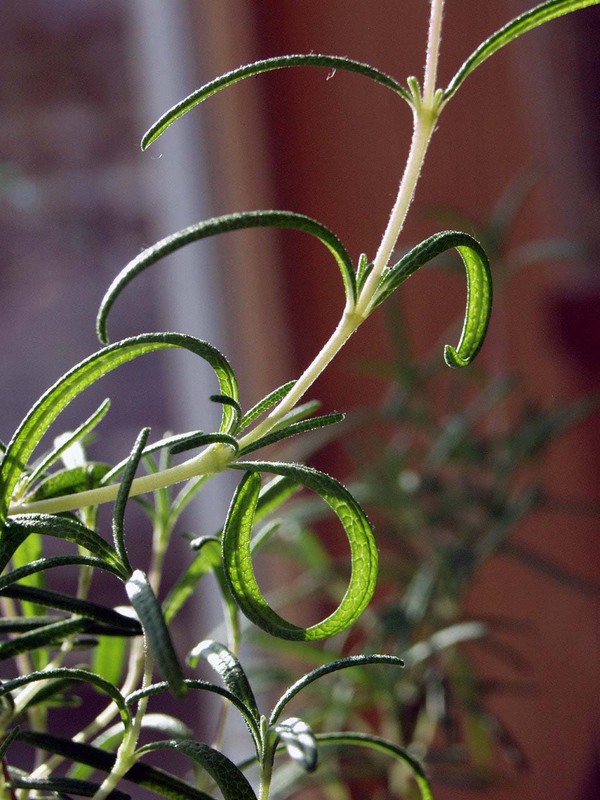 Take this little Rosemary start for example. It began about 20 years ago when I bought a small plant in a 4 inch pot in Port Angeles (PA). I repotted it into a larger pot and brought it with me when we moved to Idaho in 1998. It nearly died of a white fungus while it was indoors for a frigid Rocky Mountain winter. I pruned more than half the plant to remove the fungus and let it live if it would. It lived indeed! It thrived from the pruning and when we moved back to PA in 2003 I planted it in our yard and left it alone. Plants do pretty well if left alone, the right plants at least. One of my “little gardens”, a sidewalk runs through it. Gone for 2 summer months, this is the result of leaving plants alone. Sheers and a mug of Scotch soon fix it all. That plant reproduced itself into 4 more plants and they all grew to be about 3 feet high and pretty wide. I found their starts in the soil at the base of the first one, propagated by a natural process called “mounding” in which a branch gets laid down and partly covered with soil. New roots develop and you can just snip the branch off from the original and plant the new start. 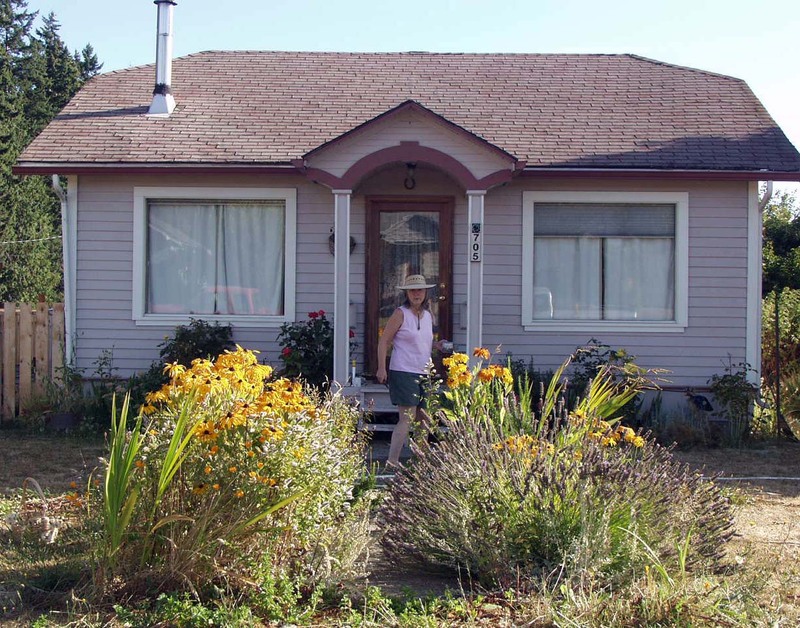 When I moved back to my Idaho home in 2013 I had 4 big Rosemary bushes growing in my Port Angeles yard. The fifth had been killed by a peninsula winter. That home has renters now so last fall I started 3 new little Rosemaries from trimmings when I pruned one of the large herbs to clear the sidewalk for safe passage. I popped the little cuttings into small pots of plain old potting soil, kept them damp at the risk of causing rot, and sure enough they began to show new leaves. When new leaves appear you know the roots are developing. 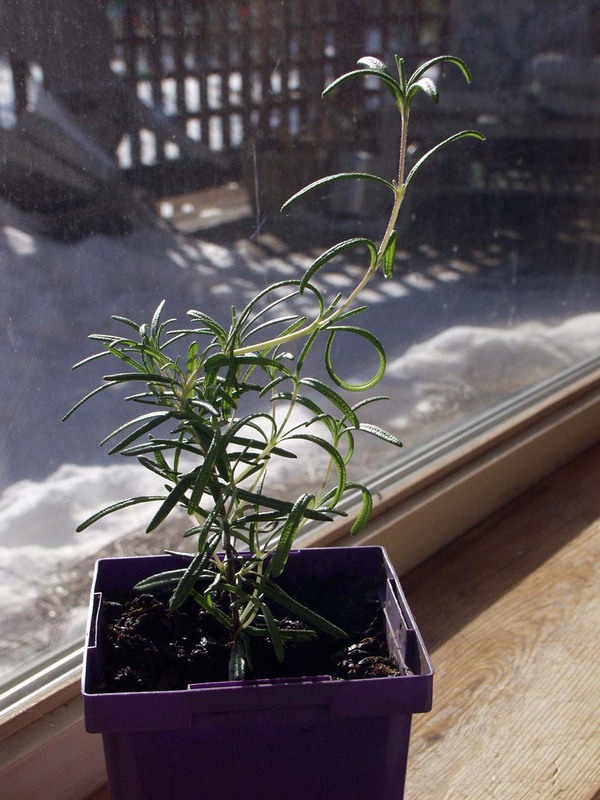 I pinch off new growth and use it for aromatic flavors in the kitchen. 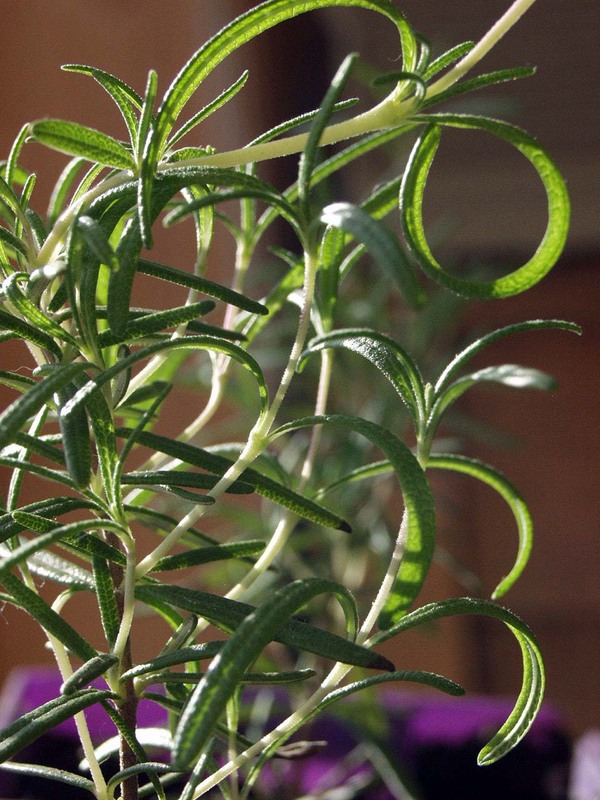 Even little herbs do their jobs just fine. Removing new growth promotes root development and it prevents the plant from getting spindly, making it bushy. New growth ready to be pinched off. Plants DO grow in winter. 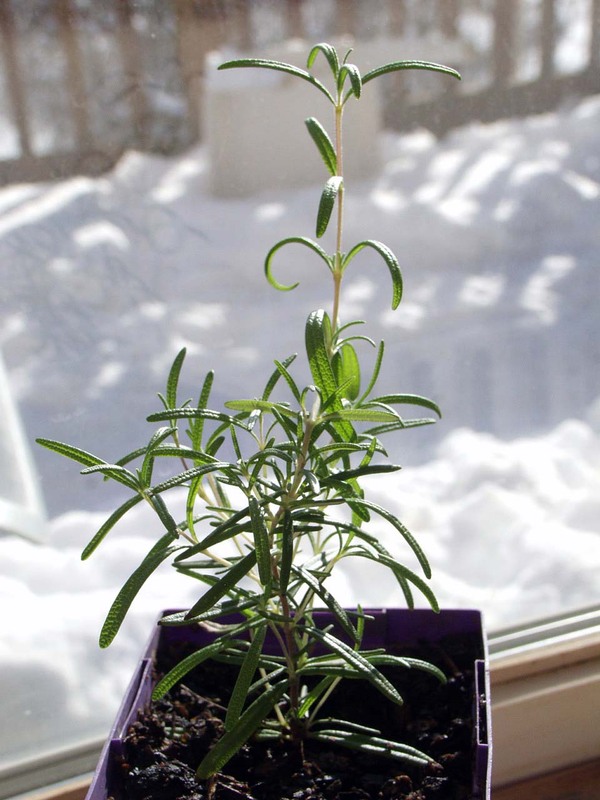 The idea that plants are dormant in winter is not precise. I keep these starts in a sunny south facing window and they are producing abundant new growth. They are beginning to branch out so by late spring when it’s safe to put them outside, they will be nice little herbs to move into larger pots. Look at all the new white branches stemming from the brown trunk. This start needs shaping. Obviously new roots are developing. If plant life is so well connected, new roots emerging from old stems, how can our human lives not be interconnected, too? I’m not just talking about genetics here. I am rooted in the Pacific Northwest and have restarted myself more times than I can recall. We can nurture our own roots and use them not to anchor us to one place or one idea, but to set us out on new paths. We can nurture new roots in people we encounter, too, without even knowing it. Some people say I am the most grounded, rooted, person they know. If that’s so, it’s because I have learned that I can regenerate myself when I need to and I’m not afraid to take that risk. Well, a little afraid but brave. My daughter calls me spunctuous, a word she created. She asked if it’s OK to make up words. Of course it is.